Set contains five 13" x 19" Tibetan prayer flags; one in each of the 5 primary colors. Your choice: images & prayers of either Wind Horse (Lung Ta), Guru Rinpoche, White Tara or Amitayus. Note: Cotton flags and 5 color cord may be burned if it is desired to "retire" prayer flags from use. These colorful prayer banners, when hung outside, bestow blessings on the surroundings, sending prayers on the wind for the benefit of all sentient beings. 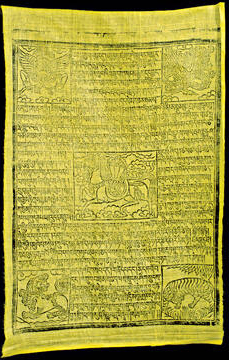 Woodblock prints on quality cotton, each flag portrays a deity, or auspicious symbols, with mantras. Each set contain five 9 ft. flags in the primary colors.